The word “science” covers a lot of ground. If Dr. Ryan D’Arcy were to chart that ground and identify its most fertile feature, it would be this: science’s ability to be applied to real-life situations and bring about practical, tangible, positive changes. Ryan is one of the world’s foremost neuroscientists. As Group Leader and Senior Research Officer for the National Research Council’s (NRC) Institute for Biodiagnostics (IBD) in Halifax, Nova Scotia, he’s been the brains behind a number of significant neuroscientific discoveries and inventions. He played a key role in developing and creating NeuroTouch, a three-dimensional, touch-sensitive brain simulation that enables surgeons to rehearse patient-specific virtual surgeries in a highly realistic environment. He also founded the award-winning team that built the Halifax Consciousness Scanner (HCS), a portable, reliable device that can quickly determine neurological function. And he’s leading the way in exploring the controversial realm of white matter in the brain. Those are just three examples of Ryan’s extraordinary contributions to the field of neuroscience. If you read his extensive résumé, you’ll find a long list of achievements to complement those developments. He has published more than 125 works, including papers, chapters and patents, and is the recipient of many awards, such as several Nova Scotia Discovery Awards, two NRC Outstanding Achievement Awards (one for Public Awareness, the other for Community Involvement and Capacity Building) and the 2011 Public Service Award of Excellence (PSAE) for NeuroTouch. Ryan is making his peers, and his country, very proud with his forward-thinking approach and his devotion to improving lives through scientific discovery. Case in point: his cutting-edge research with Trevor Greene, the retired Canadian Forces captain who suffered a devastating brain injury while serving in Afghanistan in 2006. Ryan has been working with Trevor and his extraordinary wife Debbie Lepore Greene since 2009, tracking Trevor’s progress and studying how his brain is—amazingly—rewiring itself to compensate for the missing and damaged tissue. Their goal is to use Trevor’s success as an example not only of what the brain is capable of, but also of the fact that there is great value in what Ryan calls “brain hope” (more on that a little later). It was Trevor who recommended Ryan to me. We’d been emailing to arrange Trevor’s upcoming joint Kickass Canadians profile with Debbie (which will be an absolute honour for me to write), and he was keen to bring attention to the amazing work of his good doctor. “Ryan got in touch with me shortly after (Peace Warrior, the documentary about my recovery from the attack in Afghanistan) aired, and he had such a kickass idea about doing such cool, original research,” says Trevor. I couldn’t agree more. Ryan’s ideas and accomplishments are very cool. If you had the notion that scientists can only be found locked away in the bowels of a university lab (as he jokingly suggests more than once during our interview), I cite his career as an example of taking science out into the wide world, giving it a face and—best of all—bringing its findings to bear in very real, very meaningful applications that have already helped countless people worldwide. Ryan is considered a world leader in diagnostic imaging of the brain. He’s come a long way from his days of dissecting dogfish brains for his high school biology class. Born and raised in Williams Lake, British Columbia, he left to attend Vancouver Island’s Brentwood College School, where he took an immediate liking to biology and physics. “I always liked to take things apart to try and figure out how they worked,” he says. After graduating high school in 1990, he went on to immerse himself thoroughly in the world of the mind. He picked up a BSc from the University of Victoria in 1996, an MSc (in 1998) and PhD (in 2002) in Neuroscience from Dalhousie University. 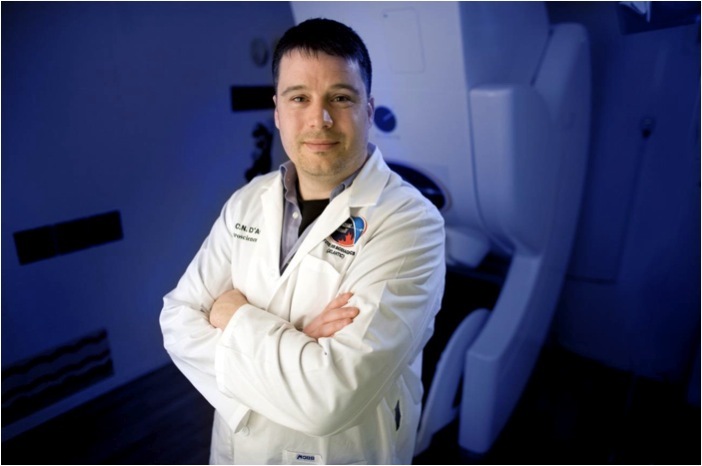 Then he did a Postdoctoral Fellowship in Magnetic Resonance Imaging (MRI) at IBD in Winnipeg, Manitoba, before moving to Halifax, Nova Scotia in 2003, where he transitioned to head up NRC’s Atlantic biodiagnostics team. These days, he splits his time among a number of roles. In addition to his ongoing work with NRC, he’s Associate Professor, Radiology, Psychology/Neuroscience and Anatomy/Neurobiology at Dalhousie University. He’s an accomplished speaker, travelling frequently to deliver talks at conferences around the world. Most important of all, he says, he’s a devoted father to five-year-old son Rhys. “He’s the top priority in everything,” says Ryan. Ryan is doing more than making an attempt. He’s succeeding, and at an astonishing rate. Take his work with NeuroTouch, which he calls “a story for Canada to be very proud of.” Around 2008, he and a team of scientists began developing what he describes as the surgical equivalent of a flight simulator. NRC amalgamated some of the best neurosurgeons in the country, drawing from more than 20 clinical neurosurgical sites and six technical NRC sites. Together they created a brain surgery simulator. Working from MRIs of real people, Ryan’s group provided the development team with the critical data needed to build a virtual brain surgery simulator. The first of its kind, NeuroTouch enabled surgeons to practise patient-specific surgeries before performing them on the actual patient. In 2009, he and his team put NeuroTouch to the test for the first time. They ran a trial on Ellen Wright, a patient at the Queen Elizabeth II Health Sciences Centre in Halifax who had a benign tumour near the part of her brain that controls speech. She wanted the tumour removed, but was very worried about losing her speech in the process. NeuroTouch allowed the surgical team to determine the outcome of her surgery even before bringing Ellen into the operating room. When Ellen was discharged, her success story made big news, catapulting NeuroTouch to fame. The simulator was exhibited at the inaugural USA Science & Engineering Festival in 2010, and its makers were soon fielding countless invitations to demonstrate the technology at world-class organizations across the globe. As proud as Ryan is of NeuroTouch, his proudest medical achievement is his work with the Halifax Consciousness Scanner (HCS), which offers a new way to diagnose brain status following trauma. Prior to the HCS, brain damage was assessed using tests like the Glasgow Coma Scale (GCS). The GCS focused on behavioural responses (e.g. the ability to move or speak) and provided a quick, simple way of evaluating brain status after injury. But, as Ryan says, it proved to be inaccurate as often as 50 percent of the time. He’d seen many patients benefit from EEG measurements in cases where people who might otherwise have been dismissed as vegetative were proven to be far more consciously aware than was previously assumed. There was no question as to the effectiveness of brain wave assessment. The challenge lay in making this advance accessible to people beyond the isolated and restricted lab setting. Ryan conceived of the HCS to bring these technological advances to people everywhere. He knew that testing brain function was “at the top of the critical care cascade,” playing a key role in determining the direction of continued care. He wasn’t about to sit idly by while patients were potentially misdiagnosed by the GCS. Moving full steam ahead, he led his team in developing a portable EEG device that would allow rapid, straightforward, accurate assessment. Speaking of tremendous rewards, Ryan’s ongoing work with Trevor and Debbie has borne some incredible results. Ryan contacted the couple in 2009 after hearing an orthopedic specialist in Peace Warrior tell them she didn’t think Trevor would be able to walk again. Knowing that his injury was in his brain and not his legs, Ryan was determined to do everything he could to accurately assess whether or not Trevor could in fact become ambulatory. Ryan uses Trevor’s legs to illustrate his point. Trevor’s injury occurred in the part of the brain that dictates motor control for leg movement. “If you’re a rehabilitative specialist, you can only measure changes related to gross improvements in movement,” says Ryan. So far, Trevor has shown significant improvements in his leg movements. But his brain needs to reconnect more circuits before he’ll be able to walk on his own. His innovative work with the Greenes isn’t the only way Ryan’s breaking new ground in his field. He says his proudest scientific achievement is in discovering the activation of white matter—something that’s constantly overlooked in favour of grey matter, despite the fact that it comprises about half of the total tissue in the brain. In Ryan’s mind’s eye, that means the vast majority of current literature about how the brain functions is missing half the picture. If you were to create a scan of Ryan’s life and map out his achievements—both past and future—as landmarks along the way, you would likely find a huge array of paths and highways. Such is the nature of work that’s so varied and complex. But although you might see many routes leading to and from each landmark, you’d also see that each one shares a common destination: the betterment of humankind. To contact Ryan, email rdarcy@sfu.ca or rdarcy@dal.ca, or visit his LinkedIn profile. Great profile. We are proud of Ryan’s work. Maura, thanks for writing. I suggest you contact Ryan via email – his addresses are listed above. Good luck!